Android Masterchef is a small utility for Windows Computer which allows you to change the boot of your android device, change the stock recovery to custom recovery or change the custom recovery to stock recovery, deodexing the system files, creating .img files and creating .dat files. It also allows you to edit the EBR files, Import files from the Smartphone to the computer, mining .img or .dat files. It also allows you to sign any zip file by copying the zip signature in the project folder. It also allows you to unpack or repack the boot_unpack file, unpack or repack the recovery_unpack files. You can also extract the system.img or generate system.img file, extract system.new.dat file. [*] Compatible: The above tool runs perfectly on Windows XP, Windows Vista, Windows 7, Windows 8, Windows 8.1 and Windows 10 (32 bit and 64 bit). 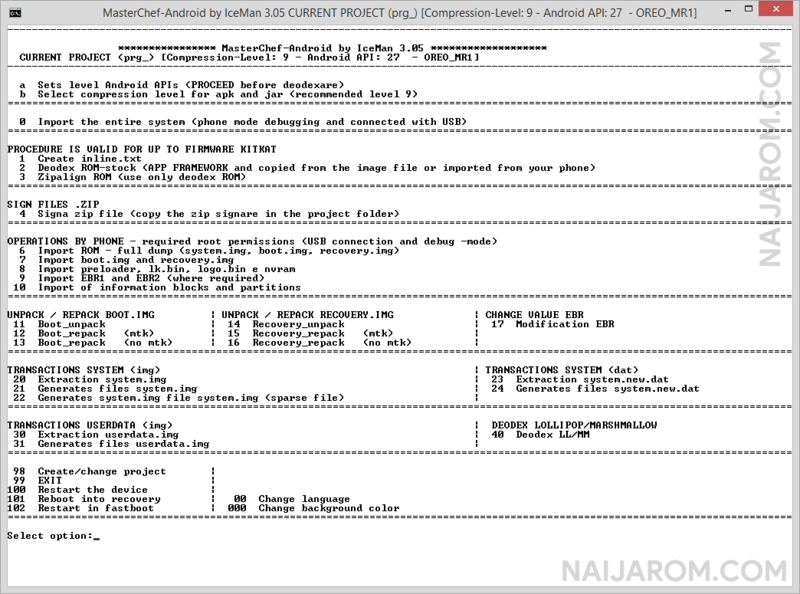 [*] Credits: Android Masterchef Tool is created and distributed by Iceman (developer). So, full credits goes to IceMan (developer) for sharing the tool for free.